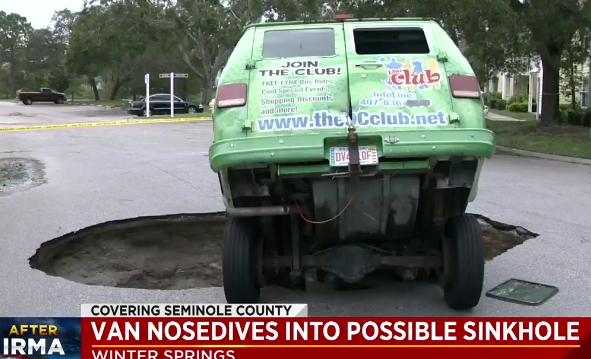 WINTER SPRINGS, Fla. - A man driving a van during Hurricane Irma Sunday night took a nosedive into a sinkhole that opened up at a Winter Springs apartment complex. Residents at Astor Park said Monday that they've noticed damage and debris across the apartment complex, but the gaping sinkhole in the middle of the parking lot is by far the most concerning. "It makes me a little nervous honestly to have something that massive in your front yard," resident Christin Blondin said. Residents gathered around gathered to take a gander at the precarious van with its rear end sticking out of the earth. "It was kinda nice to have the whole neighborhood gathering to watch this process," Blondin said. A tow truck was brought in to salvage the vehicle, but the chain snapped so another larger tow truck was brought in to get the job done. Now, residents are left wondering what will be done to keep the same thing from happening in the future. "I think that this is really dangerous for the community," resident Tyani Baptiste said. For now, a barrier has been put around the hole to keep onlookers out. Officials said the driver of the van is doing all right after the crash.